The Osprey Transporter 90 is a wheeled duffel that is both rugged and versatile. It will serve just as well on a resort holiday as a major overseas expedition. I tested it out for a couple of months car camping in Sydney and on a 6-week expedition to North America. I ditched backpacks as a primary travel bag a long time ago. 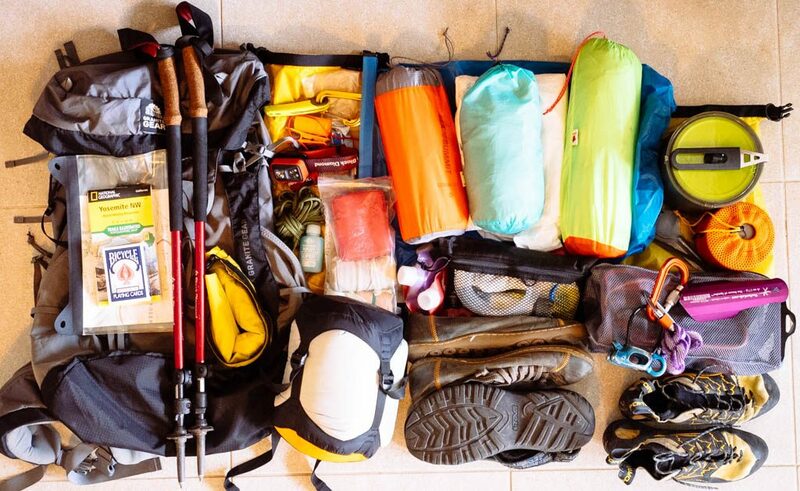 Sure, it might have been a shallow, aesthetic decision – my backpacking days are over after all – but it’s also a practical one. The downside to suitcases, however, is their weight and unsuitability for pretty much all outdoor activities. Duffel bags can be painful to shoulder. Enter the world of wheeled duffels– tough materials, bomber zippers and weather resistance that you can wheel into a hotel lobby! There are a few of these on the market and Osprey has just released a wheeled version of their tried-and-tested Transporter series. Wheeling my way out of Venice Beach, Los Angeles. Photo: John McCann. 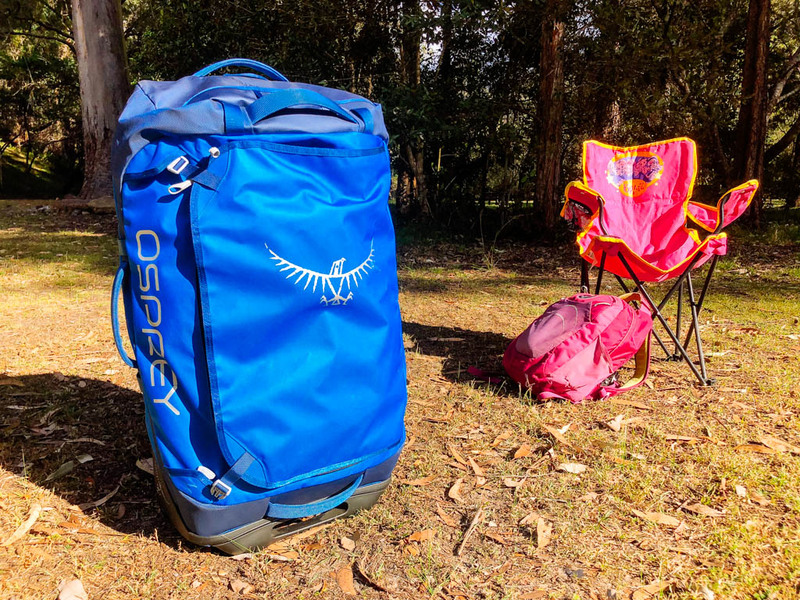 Osprey bang on about their proprietary “Highroad Chassis”, a fancy way of saying that the bag has big wheels and more clearance than your average bag. But that’s important for a piece of hybrid, indoor/outdoor equipment: you can wheel this bag through the lift lobby of a Vegas Hotel, over beaten up pavement in Los Angeles and a dirt track in Yosemite National Park (as I did!). It’s now a staple in my car camping kit too. The Transporter made a daddy-daughter escape a breeze: its wheels transformed a 250m slog from car to camp site into a gentle stroll. The wheels floated across grass like an SUV on a dirt road and, with the help of another trolley, I only had to make one trip (it helps if you pack light). Wheels are my new thing on car camping trips: the Transporter 90 and my trusty old trolley made life so much easier. Note the clearance between the bag and the ground. Photo by my daughter. One of the reasons I wanted a duffel was because I was undertaking an expedition-holiday through California, USA and British Columbia, Canada. The highlights were a 4-day walk in Yosemite, bouldering in the Buttermilks (both in California), clubbing in Las Vegas and some crack-climbing in Squamish, BC. I was somewhat sceptical that I could fit all my gear but needn’t have worried. The duffel swallowed up a 60L backpack, tarp, bivy sack, sleeping bag, pot set, sleeping gear, hiking poles, water filter, climbing harness, climbing shoes (I didn’t take a rope or climbing rack) and more. I also threw in a pair of dress shoes and outfit for Vegas. Oh and enough clothes to carry me through alpine areas, sub-alpine lakes, beachside towns and hot deserts. 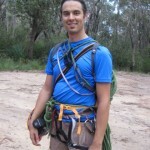 The long, thin shape of the duffel bag was important as it allowed me to fit taller gear – notably the poles and backpack. All the sleeping gear, shelter and clothes for a quick daddy-daughter getaway car camp (I packed a 2p tent). With a large, D-shaped opening and a couple of internal mesh pockets, getting stuff in and out was easy. The only caveat is that you’ll need to be pretty systematic with your packing and have separate bags/cells for all your items. One handy feature was the external zipped pocket on top of the bag. I used this to stash small items like an energy bar, pocket knife or toothbrush that I might need access to quickly or pack at the last minute. By the end, my bag was bulging with extra holiday purchases. The heavy-duty zippers still closed without much fuss. There’s also a clip that allows you to connect other Transporter duffels but I couldn’t really test this out. Finally, the bag actually looks pretty smart. By coincidence, I accesorised: my old (Osprey) daypack is a matching shade of blue. The Transporter 90 weighs in at 3.5kg (7.8lb) . To my surprise that’s actually heavier than a similar-volume, soft-sided suitcase like a Samsonite B’Lite (3.2kg) but about 1kg lighter than their hard-sided models. 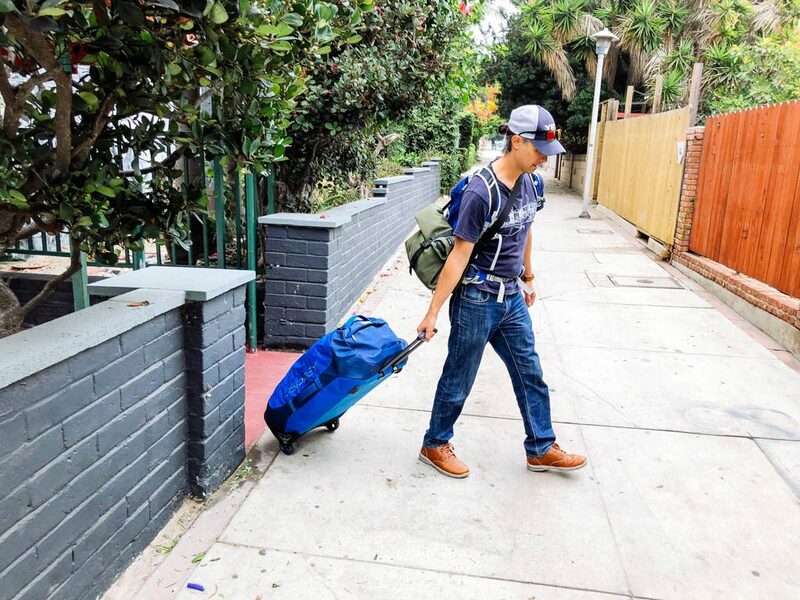 The durability of this duffel is more comparable to a hard-sided suitcase, however, not too mention a bit cheaper – it retails for A$319.95. 1kg is a pretty big deal if it’s the difference between being able to carry your sleeping bag or not (keeping in mind the 23kg maximum weight imposed by most airlines). You probably don’t need the 120L version of this bag unless you’re doing some really big expeditions or transporting very bulky gear. You’d likely need to check it in as oversized/weight luggage too. All the technical gear (and some dress shoes) for a 5.5 week holiday/expedition ready to pack. Packed and ready to roll! There was still ample room to fit clothes, toiletries, a novel and other travel items. Given the punishment meted out by unforgiving outdoor environments, the 840D Nylon fabric for the main bag is the right material choice (that’s over double the density of Samsonite B’Lite’s 400D nylon). It’s also got a TPU coating which adds abrasion and weather resistance. On paper, it’s bomb-proof. In reality, I was disappointed to find a gouge marks in the TPU coating after I fished it off the baggage carousel in LA. It was the bag’s first flight. The marks didn’t get any larger over subsequent flights/transport. Maybe it was just a freak accident that resulted from a sharp edge. Maybe the TPU coating prevented a full tear. Either way, I had hoped for my bag to remain pristine for a bit longer. The wheels are solid plastic and should last the distance (my last suitcase’s wheels started to disintegrate after five years, despite only moderate usage). If I was a proper gear review site, I would be outside spraying my bag down with a hose. However, as a weekend warrior blogger, I can only report on experienced conditions (which were mostly dry). Still, there can be no doubt that the TPU coating (when it’s not gouged) makes the bag 100% waterproof. There are generous storm flaps over the zippers too so I would expect the Transporter to fare way better in a rainstorm than a suitcase or backpack. Still, use some waterproof bags inside the duffel if you’re going to lash this to the roof of a bus during monsoon season. 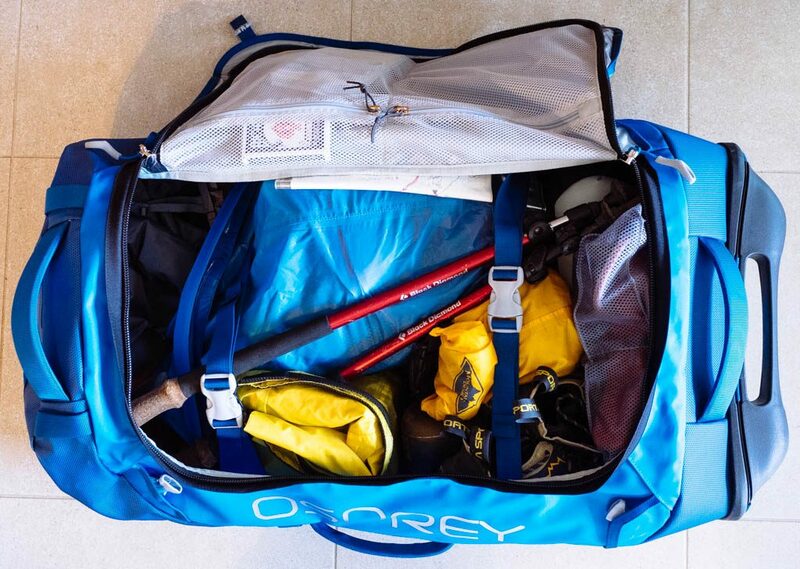 Disclaimer: Osprey sent me the Transporter 90 for review and I got to keep it. The views are my own. If you only need one piece of wheeled luggage in your life, consider buying this and putting your old suitcase on Gumtree. 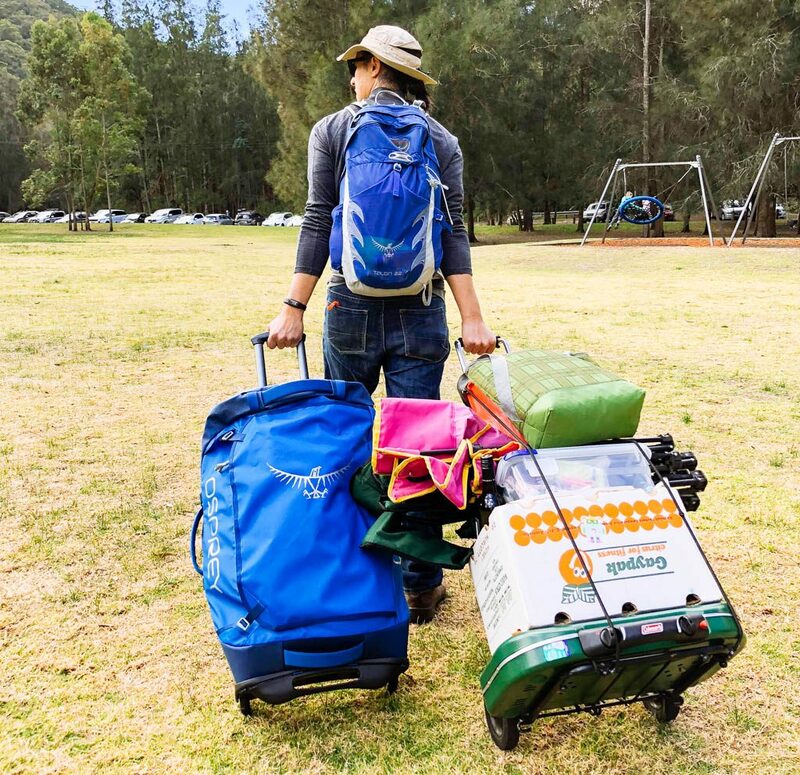 The durable high-clearance wheels of the Transporter 90 are the clear differentiator against both suitcases and other duffels. 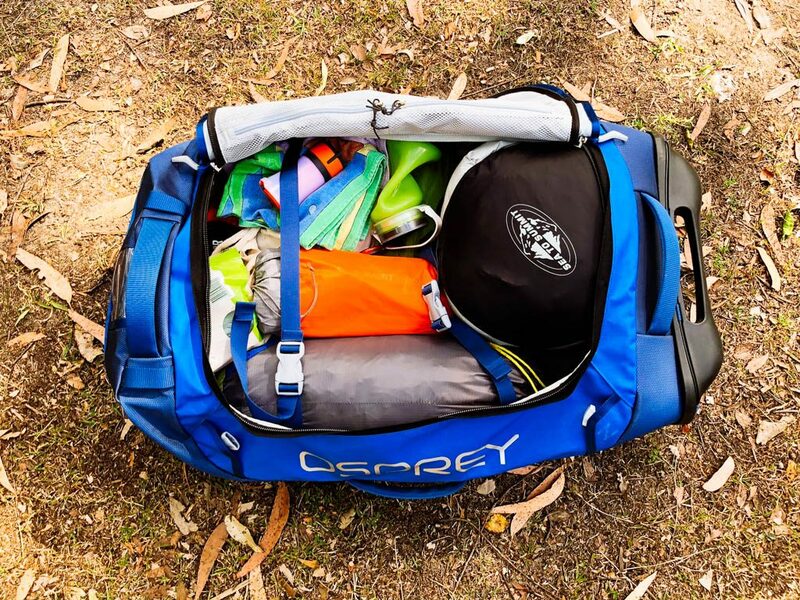 The design is quite smart and its 90L volume easily swallowed up all my (lightweight) kit for a multi-sport expedition and a car camping trip.